The Need: Thousands of proximity switches are required aboard all ship classes for proper operation of traveling and moving equipment such as weapons elevators, aircraft elevators, hangar bay door systems, crane systems, deck edge doors, watertight doors and hatches. Both mechanical limit switches and the proximity switches now in use are unsupported and obsolete. Their locations in elevator trunks, catwalks and in high overhead locations makes replacement and maintenance difficult, hazardous and time consuming. Value Proposition: The new generation of proximity switches using BH Sensors patented, disruptive technology provides a form, fit, and function switch that has advanced performance, higher reliability, and enhanced functionality at a lower per unit cost than current Navy switches. These new proximity switches would reduce cost of replacement parts, reduce associated man-hours, lower total cost of ownership and increase readiness of mission critical systems. Requirement: New mechanical limit switches and proximity switches are needed with greater reliability and durability for the maritime environment. Customer Specifications: The newly designed military qualified proximity switch is required to maintain a consistent actuation curve over a temperature range of -20 to +70 degrees Celsius, a relative humidity range of 0-100 percent and in the presence of rain accumulation of up to 4 inches per hour, and meet MIL-STD-461F EMI (above deck to 200V/m) and MIL-PRF-24711B requirements including,MIL-S-901 ( Shock ), MIL-STD-167-1 (Vibrations) and MIL-STD-1399-300 ( Shipboard Electrical Power Interface). 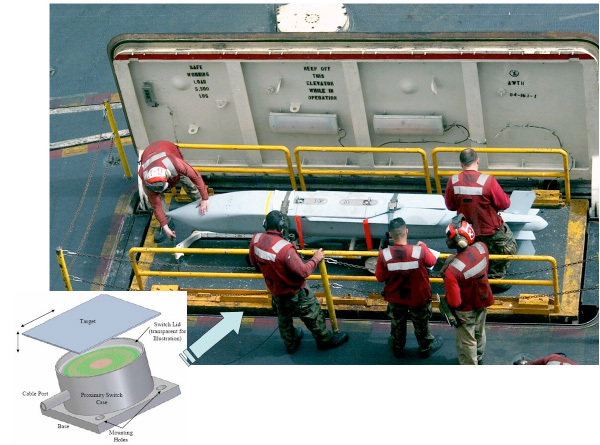 Technology Description: Utilizing a highly innovative technique to perform the sensing measurement, BH Sensor’s proximity switches perform more reliably and achieve significantly higher performance than current existing Navy proximity devices. The combination of this disruptive sensing technology and unique electronics design and packaging achieves significant reductions in individual component and total ownership cost. The BH Sensors proximity switch is applicable to all classes of Navy ships to include various traveling equipment such as weapons elevators, aircraft elevators, hangar bay door systems, crane systems and deck edge doors.